Cadillac has announced the Middle East arrival of the all-new XT4, the brand’s first compact SUV. Featuring Cadillac’s new 2.0L Turbo engine and advanced technology, the XT4 delivers expressive design, confident performance and spacious accommodations. Developed on an exclusive compact SUV architecture, the XT4 marks Cadillac’s entry to the industry’s fastest-growing luxury segment. 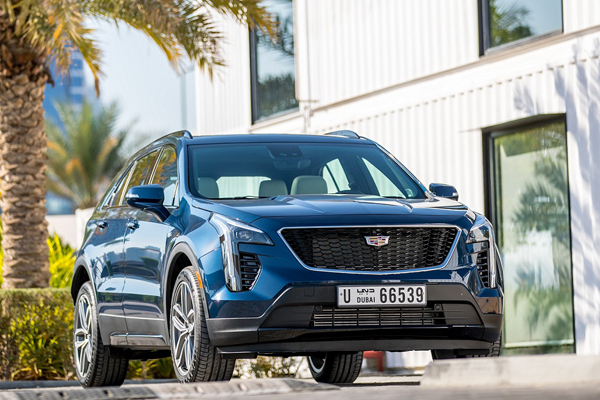 As one of Cadillac’s key regions in the world, the Middle East promises to be an ideal market for the all-new XT4, the carmaker says. Simple and sculpted lines draw the customer in and accentuate the XT4’s powerful proportions and aggressive presence. All models feature advanced LED lighting technology front and rear. Cadillac’s vertical L-shaped lighting signature is stretched horizontally, emphasising the XT4’s width and confident stance. The interior is the Cadillac design aesthetic distilled: the thoughtful and artistic integration of technology and appealing style. The cabin is exceptionally refined, with expected segment-leading rear-seat spaciousness. The new XT4’s cabin conveys boldness and strength with youthful athleticism. Sweeping arcs and tapered lines enhance the feeling of spaciousness and give it a taut, tightly wrapped appearance, the company says. The XT4 also sees the debut of Cadillac’s new global “Y” trim strategy, with specific content and styling cues featured on distinctive Premium Luxury and Sport trims, tailored to different customer tastes and preferences. Seven exterior colours are offered on the 2019 XT4: Autumn Metallic, Crystal White Tricoat, Twilight Blue Metallic, Shadow Metallic, Red Horizon Tintcoat, Stellar Black Metallic and Radiant Silver Metallic.